Headlines: Fishing has been varied with some anglers having good sessions over Easter and the past week while others have found only a few fish. Though the Eucumbene bite appears to have slowed the fish quality is still sensational. Rivers:- Continue to be worth a look in the daytime for some fun dry fly fishing. The fishing during the daytime will be good with small dry flies like hoppers and stimulators being a good option along with emerger style patterns during the evening. *Had a most relaxing weekend away at Alpine Habitats (on the way to the Thredbo) on the weekend and though I didn't get any fishing done, the proprietor Mal Tarbuck showed me a few photos of some nice fish out one of the local streams that he has been catching on dries recently. Real quality rainbows and some healthy browns. A great place to stay for fishos and some great fish and fishing in that local area at present. *One angler reported gettting seven fish in a mid afternoon session on the Eucumbene River late last week. The fish were not huge but provided some good fun smashing hopper patterns. Evening fishing has been the best overall with early mornings being quite good also. Standard streamers like Hammils, Simpsons, Tom Jones have been the best fish takers with nymphs also veing good during the day. 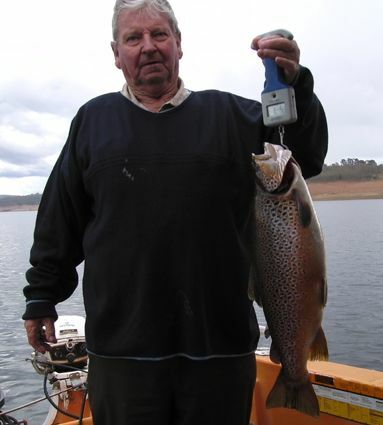 Ray Blundell finally caught a decent size fish caught at Lake Eucumbene recently - 7 lb 6 oz brown trout - Not bad but no 16 lb 4 oz fish like mine - keep trying dad! Should have noted that's my grandfather, John Blundell, holding the fish - he's 80 years old - and apart that he can't see very well, cameras these days are too technical and so poor dad didn't get in the photo with his fish. I fished off the bank at Kalkite from 3.30 to 6.00 pm on Good Friday and got three nice rainbows on scrub worms and power baits. 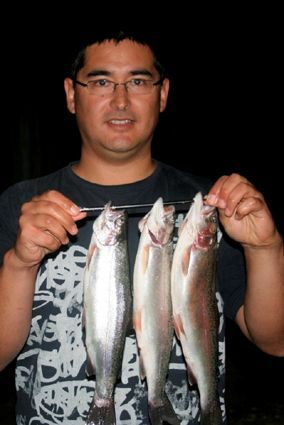 The first fish was at 4 pm and the next two were caught at 6 pm, just as a thunderstorm was approaching. The last fish was probably the unluckiest fish in Jindabyne that day. I was using 1 kg line and the fish was very feisty so I let the fish play itself out near the banks. Just as I thought the fish had played itself out, it swam around a small rock and snapped the line. Fortunately, it just sat in the water so I waded out and scooped it up with the landing net before it had a chance to swim off. The fish were not big but still happy to take home some nice fish for Easter.